It’s flu season again. And for most of us who get sick that means a trip to the doctor, perhaps some prescribed medicines, and lots of rest. But what did George Washington do when he got sick? Although most of us likely think of our first president as perpetually healthy and strong, he was actually stricken by quite a few serious illnesses in his lifetime, many of which occurred while he was growing up at Ferry Farm. Mary, George’s mother, had a few options when caring for her sick children but a hospital was not one. They did not exist yet. The most expensive solution was to call a doctor (Back then, they came to you. You do not go to them). Most people could not afford a doctor’s visit, however, and many distrusted doctors as being worse than the diseases they cured. This fear of doctors was somewhat justified given that George ultimately died of an illness he could well have survived had he not been bled to death by his doctors. Option number two was to visit a pharmacy. Now, we’re not talking Walgreens. Think smaller and jars full of leeches. Anyone could visit an 18th century pharmacy without any kind of prescription or referral. If you had the money, you could purchase whatever ‘cure’ you wanted. The pharmacist was not necessarily a medical professional and may or may not have been good at diagnosing whatever illness you had. That didn’t mean you couldn’t walk out of a pharmacy with any and all manner of odd concoctions that cured you or did not cure you. For instance, folks were awfully fond of self-treating with mercury tinctures until well into the 19th century, which we now know to be a colossally terrible idea. One can only assume that the last ingredient was to help the mashed snails go down. We do have evidence showing the use of home medicines at Ferry Farm in the form of numerous ointment pots. At least half a dozen have been identified thus far. Ointment pots were used for holding various medical or cosmetic unguents likely made at home. Generally, such pots were fairly plain with a rolled or flared lip used to secure a textile, hide, or paper lid with a string. Three white salt glazed stoneware ointment pots excavated from the Washington house cellar at Ferry Farm. Judging by their lack of use wear, the pots recovered at Ferry Farm were used for storage, not for actually manufacturing medicines. The act of stirring or grinding substances in the pots would have resulted in microscopic striations or scratches in the glaze and these are absent in the Washington family ointment pots. However, they do indicate the storage of medicines at Ferry Farm. Given the nature of home remedies in the 1700s, one’s imagination can run wild thinking of all the interesting concoctions that they may have held! Fuller, Thomas. Pharmacopoeia extemporanea : or, a body of prescripts. In which forms of select remedies, accommodated to most intentions of cure, are propos’d. London. 1710. Hume, Ivor Noel. A Guide to the Artifacts of Colonial America. University of Pennsylvania Press, Philadelphia. 2001. Hume, Ivor Noel. Early English Delftware from London and Virginia. Colonial Williamsburg Foundation, Virginia. 1977. Mellor, Maureen. Pots and People that Have Shaped the Heritage of Medieval and Later England. Ashmolean Museum, Oxford. 2000. On Tuesday, September 19, 2017, Meghan Budinger, Aldrich Director of Curatorial Operations at The George Washington Foundation, presented a lecture titled “The Rooms at Ferry Farm.” Meghan surveyed how we plan to furnish the reconstructed Washington house using traditional decorative arts scholarship but also adopted skills from genealogists, architectural historians, material cultural experts, scientists, and even investigative reporters. Meghan discussed how the Washington house and the effort to accurately furnish its rooms is a prime example of the synthesis of all of these vocations. The lecture was given at the Central Rappahannock Regional Library headquarters in Fredericksburg, Virginia. “There is no man who hates the power of the crown more, or who has a worse opinion of the Person to whom it belongs than I.” – Charles James Fox, letter to Edmund Burke, 24 January 1779. Quoted in L. G. Mitchell, Charles James Fox (1997:41). “It is intolerable that it should be in the power of one blockhead to do so much mischief.” – Charles James Fox referring to King George III. From a letter to Mr. Fitzpatrick, 9 September 1781. Quoted in John Brooke, George III (1974:363-364). The Right Honourable Charles James Fox, MP, wore buff and blue apparel for this 1782 portrait by Joshua Reynolds. Credit: Wikipedia. Charles James Fox was contrary. He gambled excessively, drank heavily, and he was generally irreverent. He enjoyed resisting powerful people, supported unpopular causes, and expressed his disdain for high society by adopting a disheveled appearance later in life. His colorful British Parliamentary career spanned decades. He was a champion of liberty: including the abolition of slavery, religious freedom, the colonists’ struggles with King George III, and he supported the French people in their quest for democracy. Fox questioned King George III’s policies toward the American colonies and feared that the monarch was becoming tyrannical. It was parliament’s job to guard against such corruption. Fox and his supporters often wore apparel in the colors of buff and blue – the colors of Washington’s army – to show their support for American concerns. The Americans, in turn, honored their parliamentary champion with their own fashion accessory: they wore buttons that featured a fox, an obvious – and often used – stand-in for the controversial orator. A close-up of a “TALLIO” sleeve button from the Washingtons’ parlor cellar, c. 1766-1772. Fox hunting enjoyed wide popularity among Chesapeake gentlemen. The English Brook family brought their foxhound pack to Prince George’s County, Maryland when they immigrated in 1655. Fox hunting continued in the Brook family for generations, and the popularity of this privileged recreational activity spread. Fox hunting on horseback was an amusement of the leisure class and the chase was considered more important than the capture of the prey. By the late 1760s, Washington himself maintained a pack of fox hounds at Mount Vernon. Additional TALLIO sleeve buttons from the antebellum-era plowzone at Washington’s boyhood home. They are notably more weathered from its increased exposure to the elements given its shallow soil burial environment. Many who discover these buttons today attribute their imagery solely to the popularity of fox hunting as a sport. These buttons are often referred to as “hunt” buttons, a category that includes buttons which feature favored hobbies or athletic pursuits. Some assert that these sleeve links were widespread because fox hunting was so popular. And indeed, it was. These links – historically referred to as ‘sleeve buttons’ – enjoyed great popularity in the years surrounding the American Revolution, the Early Republic, and into the antebellum period. I believe these buttons also achieved a deeper, political meaning, however, especially in the years around the American Revolution. Due to the support by Charles James Fox of the American cause, fox imagery came to represent resistance to tyranny. A number of contemporary British political cartoons used a fox to symbolize this politician. In addition to this documentary evidence, I believe the fox imagery used on these buttons came to symbolize the fight for liberty. For those recovered buttons for which we have context, it is evident that they are especially prevalent at sites associated with the Revolutionary War and with American patriots. Colonial discord is represented in this 1776 image showing America (symbolized as a woman in a feathered headdress, center left) attacking a defenseless Britannia (symbolized by the woman at center right). Charles James Fox is represented as a fox in the background (see arrow). Courtesy of the Lewis Walpole Library, Yale University. As the political difficulties between the British Crown and the American colonies intensified, Fox’s outspoken support of colonial concerns attracted attention on both sides of the Atlantic. In Britain, some called Fox a traitor for his disrespectful rhetoric against the crown. In Britain’s North American colonies, his stoic support for their cause provided colonists a crucial ally in an unexpected, but politically powerful position. Patriots and revolutionaries enthusiastically incorporated these fox hunting-themed buttons into a celebration of Fox’s ardent support. Tallio/fox buttons have been recovered from several American Revolution-era and Early Republic era forts in Tennessee and New York. Two domestic sites associated with George Washington have yielded these buttons as part of their archaeological discoveries. Signer of the Declaration of Independence, William Paca, proudly wore a tallio/fox button. Colonial towns such as Dumfries, Virginia and Jacksonborough, South Carolina have yielded these buttons from layers dating from the Revolutionary era. Anthropologists – scholars who study people – make special efforts to identify such symbols in societies, both in contemporary studies and in analyses of past people. Symbols are especially powerful because viewers do not need to be able to read, to understand language, to hear, or to speak, in order to comprehend a symbol’s message. These messages can summon strong emotional responses. Think about how you feel when you see an American flag and how your responses might change depending on how a flag might be used at a protest, funeral, or baseball game. During the last quarter of the eighteenth century, the fox symbolized resistance to tyranny, freedom, and the pursuit of liberty. Wearing a fox button proclaimed your support for American independence. The die struck fox image on these buttons was not originally created as a political symbol for Charles Fox, however. The meaning of these buttons was adapted to that purpose after their initial manufacture. As we have seen, fox hunting was indeed a common pastime for gentlemen, and these fashionable buttons were popular among those who “chased the hounds.” As tensions between Britain and her North American colonies increased, beginning by the 1760s, the fox symbolism present on tallio buttons was malleable, and provided a gentleman with leeway in a politically volatile climate: its meaning could change according to a gentleman’s situation. Among unfamiliar company, such a multivocal symbol would allow an adroit – or perhaps even a vacillating – patriot some political latitude. Uncertain if the person with whom you’re dining is a Tory? Your innocent little TALLIO sleeve link merely celebrates a popular, recreational activity, whose roots in the Middle Atlantic region went back generations. But, at the same time, comrades in the struggle for American Independence recognized their solidarity in the symbolism of the fox: honoring their parliamentary advocate of colonial resistance to the King George III. Along with the tallio sleeve button, another apparel item as evidence for the Washington family’s burgeoning resistance to the Crown has been found at Ferry Farm. As I wrote in an earlier blog post, the Washingtons wore a mid-1700s William III sleeve button to display their resistance to George III: a monarch that many colonists deemed tyrannical in his exercise of power. On more than one occasion, Charles Fox himself compared America’s Declaration of Independence to William and Mary’s “Glorious Revolution,” and (fairly or not) drew parallels between the monarchical abuse of powers exercised by George III and James II. British subjects had the right to replace a tyrannical king with another: an example set by William and Mary, and an important precedent for the American colonists. The Washingtons’ support for the Leedstown Resolves in February 1766 provides documentary evidence for their concerns with Britain’s rule and (at the time) their loyalty to the Crown. Close-up of a mid-1700s sleeve button recovered at Ferry Farm. It features the image of King William III and reads “Gulielmus D. G.” which translates as “William by the grace of God King.” This button is another demonstration of growing resistance to George III from Washington’s boyhood home. Together, the symbolism on each of these buttons and the Washington brothers’ participation in the Leedstown Resolves demonstrates a long and growing frustration among Virginians with Britain’s colonial policies. The material expression of these sentiments can be traced back to the mid-1700s-era male apparel buttons at Washington’s childhood home. These discoveries were possible thanks to the preservation of this site, the thorough excavation of its layers, and a contextual understanding of the social and political landscape of this period. This fox/liberty symbolism apparently endured well into the 1800s in the United States. Archaeologists recovered a “TALLIO” sleeve button from the root cellar of a quarter for enslaved laborers in South Carolina: strong circumstantial evidence that this symbol of the struggle for liberty and freedom continued beyond the American Revolution. As previous mentioned, Fox was an ardent abolitionist. The layer from which this particular button was recovered dated no earlier than 1845. In this context, this symbol of liberty underwent another change and now represented a reproach displayed by enslaved Americans to highlight the paradox of slavery in what was supposed to be a democracy. Though Charles James Fox died in 1806, the use of the fox as a symbol for the struggle for freedom endured. Collectors and archaeologists have found TALLIO buttons from at least New York to South Carolina, and westward to Tennessee, where they occur at a number of United States military forts, late 1700s-era towns, and at sites associated with patriots. Bledsoe’s Station, Tennessee (1783-1795) – “civilian fort” (Context dates from c. 1783-1795). British Officer’s Revolutionary War Hut in New York (Calver and Bolton 1950: 225, 227). Dumfries, Virginia, “Late 18th century.” (Sprouse 1988:119-120). Fort Southwest Point, Tennessee (1797-1807), federal military fort. Fort Blount, Tennessee – territorial militia post (1794-1797); federal post (1797-1798). George Washington’s Boyhood Home (1762-1772), parlor cellar and antebellum plowzone. H.M.S. DeBraak, Delaware (1798) shipwreck. (Cofield 2012:103-104, 113). Jacksonborough, South Carolina. Colonial town. (Smith, Dawson, and Wilson 2008:22-23, 30). Mount Vernon, Virginia, Washington’s home (1754-1799). Recovered from a c. 1820s garden layer. Tellico Blockhouse, Tennessee – federal military post (1794-1807). University of North Carolina, Chapel Hill. Plowzone. (Fitts et al. 2012:35, 88-89). 2008 Life of Johnson. Oxford University Press, Oxford. 1950 History Written with a Pick and Shovel. University of Virginia Press. Fitts, Mary Elizabeth, Ashley Peles, and R. P. Stephen Davis, Jr.
2012 Archaeological Investigations at the Vance Site on the University of North Carolina Campus, Chapel Hill, North Carolina. Research Report No. 34. The University of North Carolina, Chapel Hill. 1997 Fox Hunting: History and Change in a Mountain Sport. Appalachian Journal 25(1):30-46. 1997 Charles James Fox. Penguin, London. 1961 Sleeve Buttons: Diminutive Relics of the Seventeenth and Eighteenth Centuries. In Antiques 79(4):380-383. 1979 Archaeological Investigations of the Tellico Blockhouse Site (40MR50): A Federal Military and Trade Complex. Report of Investigations 26, Department of Anthropology, University of Tennessee, Knoxville. 1998 British Friends of the American Revolution. M. E. Sharpe, Armonk, New York. 2000 Bledsoe Station: Archaeology, History, and the Interpretation of the Middle Tennessee Frontier, 1770–1820. Tennessee Historical Quarterly 59(3):175–187. Smith, Steven D., Audrey R. Dawson, and Tamara S. Wilson. 2008 The Search for Colonial Jacksonborough (38CN280) Colleton County, South Carolina. South Carolina Institute of Archaeology and Anthropology Report, Columbia. Presented to Lowcountry Council of Governments, Yemassee, and Francis Marion Trail Commission, Florence. 1988 A Guide to Excavated Colonial and Revolutionary War Artifacts. Heritage Trails, Turbotville, Pennsylvania..
2008 Archaeology on the Great Pee Dee River: The Johannes Kolb Site. http://38da75.com/professional.htm, accessed July 31, 2012. Diachronic Research Foundation, Columbia, SC. A generation earlier Fox’s father, Henry Fox – also a member of parliament – found himself represented as a fox on multiple occasions in political satire. The recovery of this artifact from a layer created between 1766 and 1772 indicates that “tallio” was a term popular before it first appeared in print in 1773 (“tally-ho, int. and n.” OED Online. Oxford University Press, March 2017. Web. 31 May 2017). Since this “TALLIO” button was deposited before 1773, perhaps the Oxford University Press might consider updating their “tally-ho” entry. A nice history of fox hunting is provided in Anne M. Hastings, 1997 article “Fox Hunting: History and Change in a Mountain Sport.” Appalachian Journal 25(1):30-46. Archaeology is a subfield of anthropology. Archaeologists study past peoples. Political sleeve buttons that said “Liberty” (revolutionary) or portrayed a Crown (Loyalist) provided their gentlemen no political leeway: they betrayed the political sympathies of their gentlemen quite directly. Did gentlemen who elected to wear TALLIO buttons lack commitment, perhaps coveting the ambiguous – and potentially innocent – message of the fox imagery? Samuel, John Augustine, and Charles Washington all signed the Leedstown Resolves which, though it expresses concern, is nonetheless effusive in its expressed respect for the monarchy. Carl Steen, Personal Communication, 15 April 2013. The use of folk magic may seem foreign and exotic to many of us in the 21st century. If we look closer, though, it is apparent that some modern Americans still practice it today – even if they don’t realize it. Have you ever hunted for a four-leaf clover? Have you ever hung a horseshoe over your door? If so, you’re participating in a kind of folk magic. Folk magic is (and was) thought to be a way to influence forces, seen and unseen, for good or for ill. It is sometimes referred to as “low” magic, not because it was seen as evil, but because it was passed down generation to generation rather than learned from books or formal tutors. “High” magic has its own fascinating history, but this blog post focuses on the everyday magic that 18th century Virginians, both black and white, practiced. Hoping to ward off evil and bring peace, prosperity, and abundance into their homes, some of these early Americans used magical means to their ends. Europeans and Africans in British North America brought with them the spiritual, religious, and magical traditions of their homelands. The blending of these traditions became the bedrock for future iterations of American folk magic. 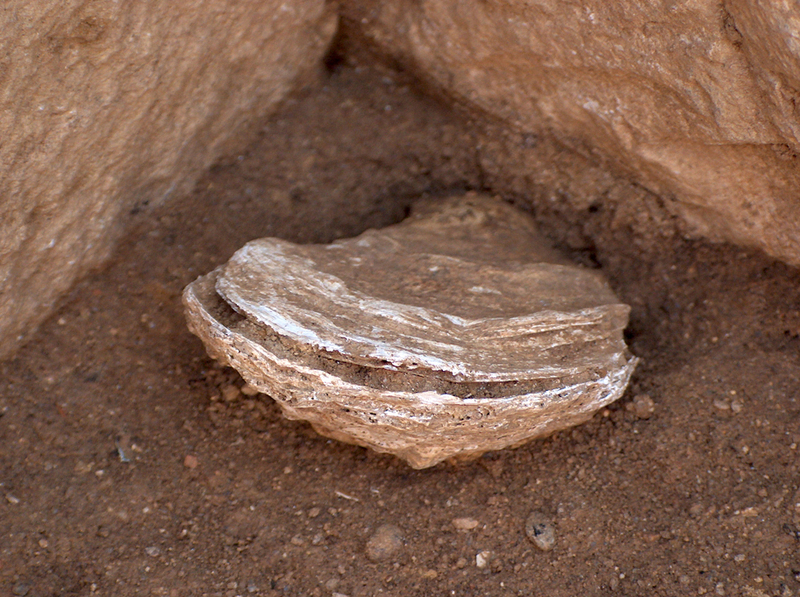 One modern archaeologist says that this blending process makes it hard to tell exactly who was using what folk tradition while creating some of the material culture of folk magic; it is not always clear from the archaeological record exactly who made an object and what that object’s intended purpose was. One of the things that may have contributed to the cross-cultural blending is the similarities between English and African folk magic traditions. Both groups recognized that there were some people who were “set apart” from the rest of the group. These individuals were believed to possess special powers that made them respected, feared, or both. African and English traditions also shared a belief in magical objects, even everyday objects, that could be imbued with power. And lastly, both groups believed in the power of burying magical objects for protection – or for malice. The rest of Du Bois’s quote, however, highlights an essential difference between white cunning folk and the enslaved conjuror. The conjuror was also “. . . the one who rudely but picturesquely expressed the longing, disappointment, and resentment of a stolen and oppressed people.” Despite their many similarities, enslaved conjurors and cunning folk operated in very different realities. In Du Bois’s estimation, the conjuror did more than just take care of the physical and spiritual needs of the enslaved; he or she took on the weight of slavery itself. 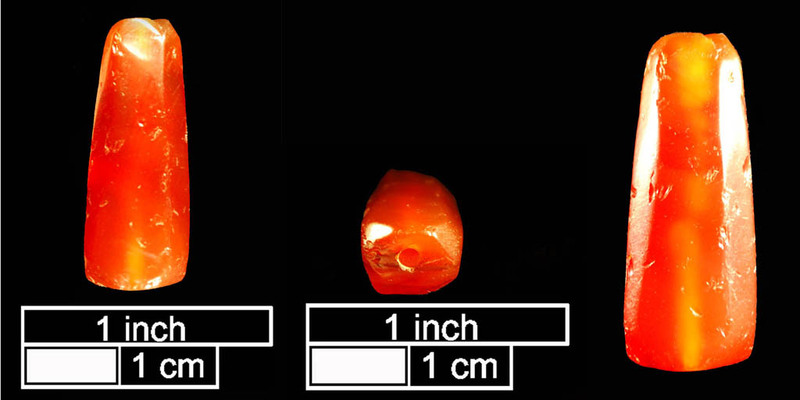 Multiple views of the Carnelian bead excavated at George Washington’s Ferry Farm. Cunning folk also made objects with magical meaning. Written charms, or amulets, were popular since they were easy to make and could be worn on the body. These charms often served as protection for people and livestock against witches’ attacks. An example of these charms can be found in Colonial Williamsburg’s Special Collections. 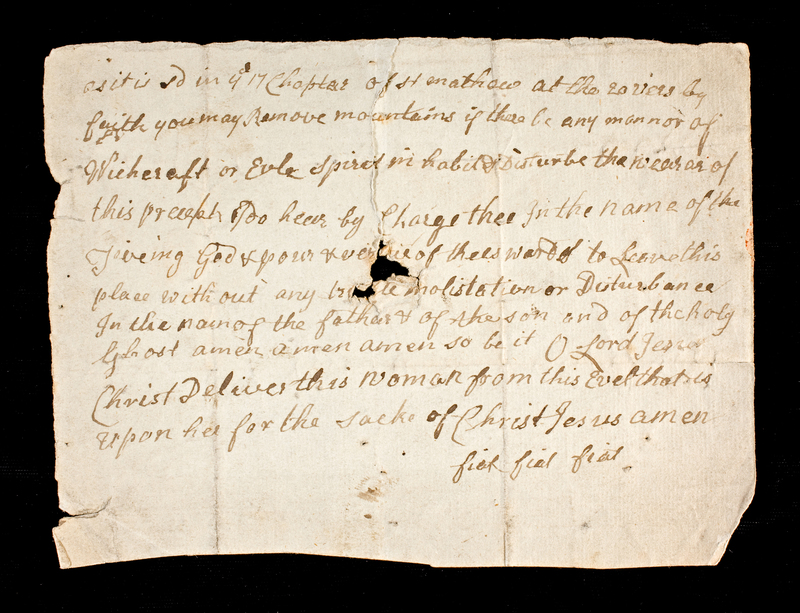 This small piece of paper, dating to about 1700, promised to protect the wearer from “any mannor [sic] of Witchcraft or Evle [sic] spirit.” The amulet invokes the power of faith and the intervention of Jesus Christ on behalf of the afflicted woman. It closes with “amen, amen, amen,” and “fiat, fiat, fiat;” “fiat” being the Latin translation of ‘amen.” “Fiat” and “amen” had been used together since the 2nd century, particularly when the prayer it ended was one of condemnation. It was not uncommon for black and white practitioners of magic, to bury magical objects for protection. The nature of these objects may have been different, but the intent was the same – warding off evil and restoring peace to the household. At Ferry Farm, archaeologists have discovered whole oysters deliberately buried in the stone-lined cellar of the Washington house. The act of burying the oysters, which were seen as magical objects in the African/African American community, was likely an effort to protect the home. They were often used in burial rituals and were associated with death and the afterlife; an association that makes the oyster shells found at Ferry Farm all the more intriguing. Whole oyster shell excavated from the Washington house cellar at Ferry Farm. English/English-Americans also buried objects for protection, but some of the objects they buried were man-made rather than a product of the natural world. Witches bottles, often glass bottles filled with pins, nails, and even human urine, were designed to cure the afflicted of his or her bewitchment. A witch bottle found near in Virginia Beach, Virginia, known as the Great Neck witch bottle, dates to 1690-1750. Archaeologist M. Chris Manning describes it as being, “[a] small, narrow, light green glass medicine vial was found buried in an inverted [upside-down] position” containing 25 brass pins and 3 iron nails. It may have also contained the urine of the bewitched at some point. These bottles were designed to hurt witches; their pins and needles were thought to injure those who placed malevolent spells on the innocent. In both the African/African-American and the English/English-American tradition, these buried objects were tasked with banishing evil forces in an effort to bring in positivity and peace to the household. These are just a few examples of the similarities between the African and the English folk magic traditions. There are significant differences, in part because “magic” was part of African cosmology, meaning religion and magic were tied together, sometimes to the point where it’s hard to tell where one ended and the other began. This is different from the English tradition, where religion and folk magic were seen as separate, at least officially. Religious and secular authority figures in colonial America condemned the use of folk magic, but this did little to stem the tide of magic’s popularity. The next time you pick up a lucky penny or even cross your fingers, remember that you are participating in a tradition older than America itself. While we may not make witches bottles or bury oyster shells anymore, there are plenty of instances where we seek luck, protection, love, and other good vibes through essentially “magical” means. Christopher C. Fennell, “Conjuring Boundaries: Inferring Past Identities from Religious Artifacts,” International Journal of Historical Archaeology, Vol. 4, No. 4, pp.284. Owen Davies. Popular Magic: Cunning Folk in English History, (London: Continuum), 2007, p. VII. W.E.B. Du Bois, Souls of Black Folk, Essays and Sketches, (Chicago: A.C. McClurg & Co.), 1903, 211. Ibid. https://www.marinersmuseum.org/sites/micro/captivepassage/arrival/arr019.html Accessed 17 October 2016. Jerome S. Handler, “An African-Type Healer/Diviner and His Grave Goods: A Burial from a Plantation Slave Cemetery in Barbados, West Indies,” International Journal of Historical Archaeology, Vol. 1, No.1, (June 1997), 91-130. David Muraca, “Murder and Magic at the Washington Farm,” George Washington Foundation, Fredericksburg, VA, unpublished report, 9. M. Chris Manning, “Homemade Magic: Concealed Deposits in Architectural Contexts in the Eastern United States,” Master’s Thesis, Ball State, 2012, 114.